In this first comprehensive study of Latin America's literary vanguards of the 1920s and 1930s, Vicky Unruh explores the movement's provocative and polemic nature. Latin American vanguardism—a precursor to the widely acclaimed work of contemporary Latin American writers—was stimulated by the European avant-garde movements of the World War I era. But as Unruh's wide-ranging study attests, the vanguards of Latin America—emerging from the continent's own historical circumstances—developed a very distinct character and voice. 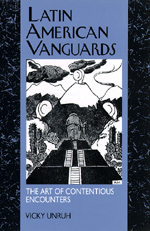 Through manifestos, experimental texts, and ribald public performance, the vanguardists' work intertwined art, culture, and the politics of the day to produce a powerful brand of aesthetic activism, one that sparked an entire rethinking of the meaning of art and culture throughout Latin America. Vicky Unruh is Associate Professor of Latin American Literature at the University of Kansas.